Die Entwicklung der Adergeflechte. Ein Beitrag zur Entwicklungsgeschichte des Gehirnes. Kollmann , Julius Constantin Ernst, 1834�18. Leipzig : Wilhelm Engelmann, 1861. Description : [v]-vii p., � p., [1 l.] pl. ; illus: 1 phot. ; 23.2 cm. 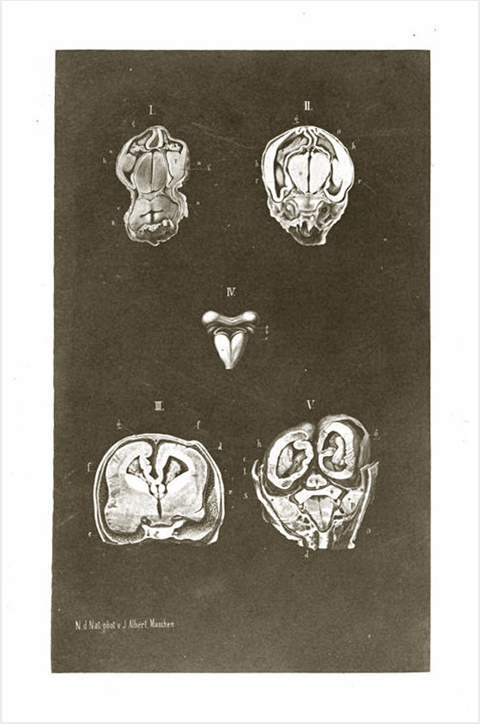 Photograph : Sepia collotype, a composite of 5 fetal head sections. Subject: Choroid plexus — Development ; Embryology. Author caption: Dr. Jul. Kollman. Pro venia legendi. Professor ordinarius of anatomy, Basel, 1878. GM-427: Kollmann (1886), Plastische Anatomie des menschlichen K鰎pers (Leipzig: Veit, »»). There is a later state of the plate, enhanced with color details and borders added by lithography, presumably to compensate for the image degradation caused by an extended press run. The image is an early example of a published collotype, a process of photographic reproduction invented and patented by Alphonse Poitevin in 1855. By the late 1860's, Josef Albert had made enough significant improvements to the process that it became widely known as "albertype." Kollmann's pro venia legendi dissertation is an impressive contribution to the embryology of the human brain. He went on to teach comparative anatomy at the University of Basel, where he became known for his writings on ethnic morphology, human development, and zoology – he is credited with the term, "neoteny," defined by the persistence of infantile traits in human anatomical development.